If you go to the internet to do research on Ballantine Brewing, one thing that is extremely had to find is when they shutdown. The demise wasn’t a grand fall from greatness like Enron, but more similar to that pub down the street from you that used to be the place to go, but now, no one does. Then it’s gone, and you didn’t even get to say goodbye. This is the ending that creates nostalgia. No one is nostalgic for Enron. Those endings are the endings that inspired the creation of the phrases like ‘good riddance.’ But when something is beloved and subsequently forgotten, it makes us sad, and it makes us miss the days we spent with the beloved. Luckily beer can be resurrected. After Ballantine’s peak in the 50s, the brand began its long and eventual slide into obscurity. Luckily for Ballantine their slide ended with their brand being under the ownership of Pabst. In recent years Pabst has made a name for itself by using nostalgia to fuel its business. The namesake brand has been rebranded into a hipster brand, National Bohemian (a former Pabst brand) was the darling of Baltimore, and their west coast equivalent Rainer also helps fuel the nostalgia market. But I see Ballantine’s revival as more than just leaning on fond memories. Ballantine has such a rich history, one that has been the inspiration for at least a few modern breweries beers. 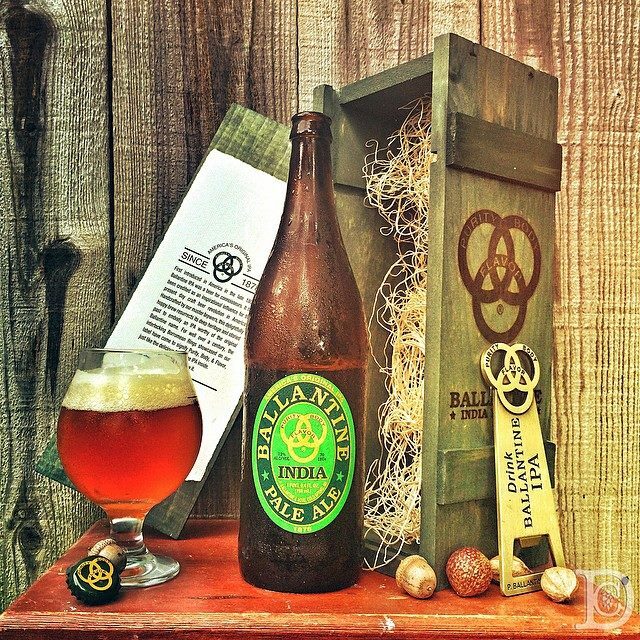 It is rumored that Anchor Brewing’s Old Foghorn was inspired by Ballantine’s Burton Ale, and Dogfish Head’s Burton Baton is also a tribute to Ballantine’s beer, being that it is like the blend of an Old Ale and IPA. Obviously recreating a beer on just nostalgia wouldn’t fly here. This had to be an honest to goodness solid beer. The Ballantine IPA wasn’t the brain child of the marketing department, like Shock Top or Blue Moon, but rather an idea from Pabst Master Brewer Greg Deuhs. He brewed dozens of small batches trying to recreate the original recipe. 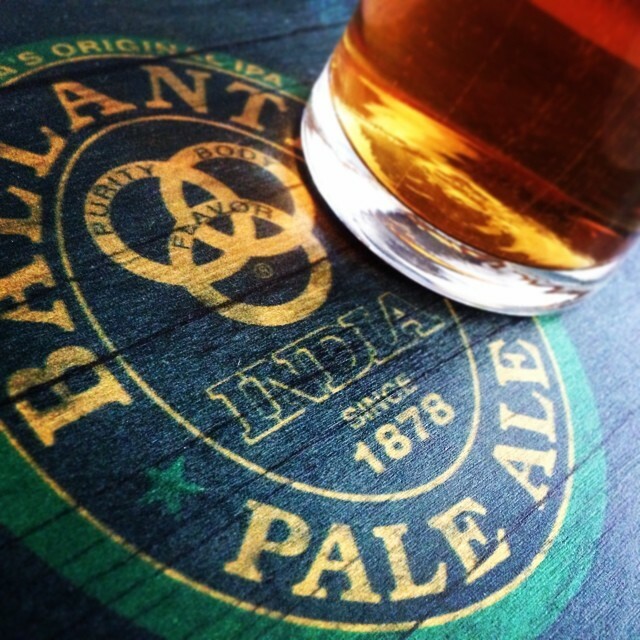 While there are a lot of resources about the original Ballantine IPA, many of the hops that had been use commercially during the heyday of Ballantine no longer exist. Acting much like Dr. Frankenstein, he took lots of other hops, grains, and experimentation with hop oils to resurrect his monster err… beer. When speaking with Greg Deuhs, he had great respect for the history of Ballantine. He also expressed amazement about the brewing processes that Ballantine used decades before our modern craft movement. Creating a 7.2% ABV, 70 IBU IPA using hop oils, dry hopping, and wood aging doesn’t sound like your typical beer from 1878, but it is. After the smoke cleared and Deuhs-enstein’s monster awoke, it seems that what was left, was indeed the solid IPA that they were betting on. As many would call this beer, it is decidedly East Coast. Considering the history of this beer that is very appropriate. Oak aging and the Munich, Caramel, and Carapils give it the depth that you would expect from an East Coast IPA. And while it certainly has the hops to match many west coast IPAs, it comes across with a bit less of an edge. Part of that is of course because of the wood, but also the hop oil blend that provides it with an Earthy hop quality with citrus notes. I was impressed; this was a very good IPA. Is it going supplant Heady Topper as the hottest IPA on the market? Probably not. But what it might do is change the landscape of the craft versus crafty debate. Their brew house at 75 bbl is smaller than many of today’s craft brewers. And is made with the same kind of reverence and love that you will find in a traditional craft brewery. Pabst isn’t hiding that they are the company behind Ballantine’s resurrection, but they did a very good job at letting the brewing team take the lead with flavor rather than some fabricated marketing scheme with a sad beer in tow. Greg Deuhs also explained to me, that he doesn’t plan on stopping with the Ballantine IPA. They are going to try to recreate much of the original Ballantine lineup, including the Brown Stout, Bock, and the infamous Burton Ale. The Burton Ale is as much of a legend as it was a historic beer. Given to employees and VIPs as a Christmas gift after being aged in oak upwards of 10 years. Don’t expect Pabst to wait 10 years before releasing this one, but from what I hear it will be a beer to age. Shock Top and Blue Moon are much too much of the craft sort of beer most of the craft market dislikes. Shock Top has stated that their goal is to trick drinkers into thinking it’s a craft product. I respect Pabst in that they aren’t trying (hard) to trick buyers into thinking that Ballantine is an independant brand. They are also employing techniques used by craft brewers. If you are looking for something like Blue Moon or Shock Top that is a truely great Belgian White, try an Allagash White.